As you probably know, we recently launched The Definitive Guide to Lead Generation, our newest and ninth Definitive Guide. Yes. That’s right — our ninth. Wow, right? The Definitive Guide to Lead Generation was the largest one yet, coming in at 160 pages of (free) information. We cover topics ranging from content marketing and website SEO to telesales and content syndication — all through the lens of lead generation. Checklists, charts, thought leadership from the leading experts in marketing today — this Definitive Guide has it all! So far it’s been quite well received (*pat on back*). MarketingProfs Chief Content Officer, Ann Handley, gave us kudos for the animal theme we incorporated. Lee Odden of TopRank Online Marketing gave the Guide some love in his Online News recap post. Heck, we even debuted our first ever music video, which was all about “lead lead lead lead lead lead generation”. Can’t see the video? Try watching it directly on YouTube. Do you agree with the tips these six super smart folks shared? Is there one you’d add? Drop your thoughts in the comments below! 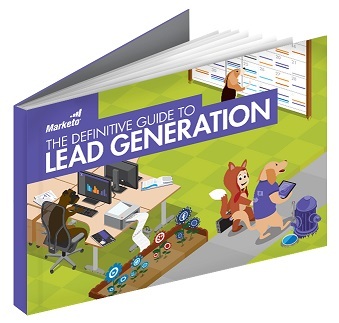 Oh, and go grab yourself a copy of The Definitive Guide to Lead Generation while you’re at it.